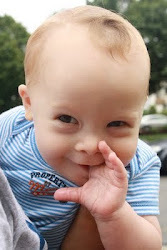 The Baby Blogs: Another First for Daniel: Halitosis! In an embarrassing turn of events, both abba and mommy have separately noted that I, a baby of a mere 10 months, have garlic breath! How has this happened? This household is anti-garlic. Mommy insists that Italian and garlic are not synonymous, that it is a widespread myth of Italian cooking. Certainly garlic does not have a starring role in northern Italian cooking. In our apartment, there isn't even a clove of the offending bulb to be found. Even abba, a Middle Easterner, is not a big fan unless the garlic appears in sujouk and other Armenian delicacies. Mommy thought she caught a whiff of garlic on my breath yesterday, but quickly dismissed the idea. I am an unadulterated baby. Babies can't have bad breath. We haven't consumed amounts of bad food yet, just pureed bits of straightforward meals, nothing complicated or unhealthy. So our breath surely is as pure as cannoli cream. But later on, abba confirmed that yes in fact, I have bad breath! So how is it that the pure, uncontaminated child has garlic breath? No garlic in my oatmeal, none in the yogurt, not even a bit in the beef stew. Then the light bulbs went off: It was the hummus! The store-bought hummus with which I have been plied has trace amounts of garlic in it. Trace, but enough to destroy the breath of a baby nonetheless. There is a reason a flower is named "baby's breath." It is because we babies are supposed to have breath like flowers. But alas, I have been contaminated by food. And it can't be my fault since I don't shop or cook. But I do believe this might be the impetus to inspire mommy's homemade hummus from now on as we forge ahead in our non-garlic household. I suppose the taste of foot has conditioned my taste buds to garlic.